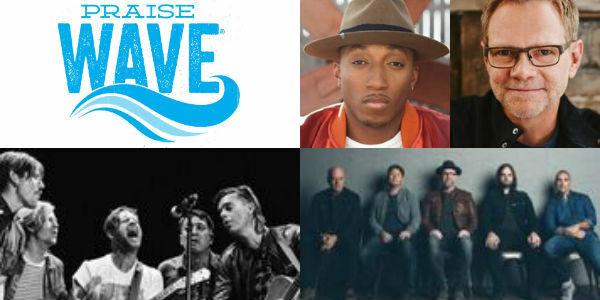 SeaWorld Orlando’s Praise Wave returns for 2018 with a live Christian music concert series that takes place every Saturday, January 20 through February 10. In a career that has spanned 30 years, Steven Curtis Chapman is the most awarded artist in Christian music history with 58 Gospel Music Association Dove Awards, five Grammys, an American Music Award, 48 No. 1 singles, selling over 11 million albums, with ten RIAA-certified gold and platinum albums to his credit. Lecrae is a two-time Grammy Award-winning hip-hop artist whose 2014 album, “Anomaly,” debuted at #1 on the Billboard Top 200, Rap, Digital, Christian, Gospel, and Independent charts. His seven studio albums and mixtapes have sold more than 1.9 million copies and he has co-headlined some of the best-selling tours in the U.S.
SWITCHFOOT has been unearthing all manner of musical gems since their 1997 debut “The Legend of Chin,” steadily expanding their global fan base and critical reputation through such releases as the multi-platinum breakthrough “The Beautiful Letdown” (2003) and the Grammy award-winning “Hello Hurricane” (2009). Beyond their career achievements, SWITCHFOOT has been active in a variety of philanthropic efforts through the band’s own Bro-Am Foundation. Live concerts take place at 1:30pm and 4pm each Saturday in the park’s Nautilus Theater and general admission seats are included with park admission. Reserved seating packages for all performances are available online and start at $19. For more information and to purchase tickets visit SeaWorldOrlando.com.